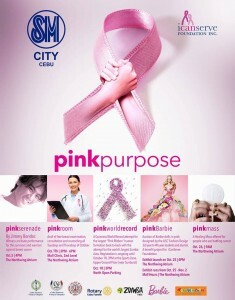 SM City Cebu and ICANSERVE Foundation Cebu Chapter host purposely pink activities to promote awareness of early breast cancer detection guidelines. It began with Jimmy Bondoc’s heartfelt tribute (Pink Serenade) to cancer survivors who continue to fight the deadly disease on October 5. This was followed by the Pink Room open for free breast examination and consultation on all Tuesdays and Thursdays of October, from 3 to 6 p.m. at the Mall Clinic, 2nd Level of the Northwing Atrium. gest Zumba class to make two entries to the Guinness World Records. The month called Pink Purpose will end with a healing mass on October 26 at 9 a.m., offered for breast cancer patients still undergoing treatment.on. A portion of proceeds will go to ICANSERVE Foundation.